Here in the Pacific Northwest, late summer and early fall is prime picking time. That is because in this neck of the woods, blackberry brambles are everywhere. You will find them along trails, next to roadways and even in the backyard rose garden where they are an unwelcome visitor and impossible to get rid of. There is a positive side to this however. Blackberries are abundant and they are free for the picking, white clothing notwithstanding (more about that later). I don’t know if blackberries are common in your area but surely there is some fruit that you can either pick yourself or purchase inexpensively from a roadside stand or farmers market. 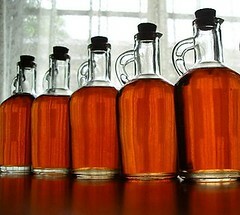 So let’s have some fun today and make some fruit liqueur for personal consumption or for barter. 1. Thoroughly wash your berries or fruit then cut in to small pieces. Don’t forget to remove all of the pits and the seeds. Peeling is optional. 2. Place the prepared fruit in a large glass or earthenware container and add the vodka or brandy. Set aside in a cool, dark place. 3. Stir the mixture once a week for 2 to 3 weeks. 4. Strain and discard the fruit. You can use a plain wire strainer or, if you want the best possible presentation, line your strainer with a coffee filter or cheesecloth first. This will insure that all of the micro-bits of fruit are removed. 5. Add the sugar and stir well. Pour the sweetened mixture back into a clean container and cover. (Hint: use the empty vodka bottle for this purpose. You can also use Mason jars.) For the first week or two, you may have to shake the bottle a few times to insure that all of the sugar gets dissolved. 6. Take a time out. (Sorry, this is the hard part. You need to let your fruity brew age for 3 months. If you want to cheat and take a little taste before then, go ahead but at least give it 2 months or you will be disappointed. 7. During the time out, scout around for some empty bottles that you will use to store the finished product. Empty wine bottles, thrift store finds, import store treasures and even funky jars will work. Just make sure they are clean. If you need lids, you can use corks purchased from a craft store or even used, plastic wine corks. 8 At the end of 3 months, do a taste test. Not sweet enough? Add more sugar. Too sweet? Add more vodka and some water in a 1:1 ratio. 9. Carefully pour your concoction into a clean bottle. Label the bottle and you are done. The flavor will continue to develop over a period of 6 months so the longer you wait the better. That’s it – were expecting more? This is where the fun begins since you are limited only by the bounds of your imagination. Make an amazing martini or sidecar. Here in my home, we use the the vodka version to make a Fruitini by mixing the fruit liqueur 1:1 with triple sec. We use the brandy version in a sidecar. Fill a glass about a third full of fruit liqueur, add ice and top with 7 up or sprite for a refreshing pre-dinner cocktail. Sip it straight as a post dinner cocktail. Pour over a scoop of ice cream for a colorful dessert (adults only). Use as a topping for homemade cheesecake. Decorate the bottle and use your fruit liqueur as a hostess gift during the holiday season. Put a supply into deep storage to use for comfort or for barter if the SHFT. As I said in the beginning, for us it is blackberry picking time. For others, there are all sorts other fruits to choose from. Some examples include blueberries, raspberries, strawberries, peaches, tart apples, pineapples, oranges, lemons, or sour cherries. Experiment with what you have on hand and feel free to mix and match. Something I have not tried yet is making fruit liqueur from my food storage fruits. It works with Survival Sangria so why not? Depending on your frame of mind, alcohol, be it wine, beer or the hard stuff, are necessary additions to the survival pantry. And even if you can not or choose not to drink alcoholic beverages, spirits are useful as a barter item. I almost forgot – a word about the clothing. Since I was in my twenties, I have made it a habit to go berry picking in white clothing. And those days, as now, a good percentage of the berries end up on my clothes as well as in my mouth. It is a standing joke in my household that when I am wearing all white, I must be headed out the the berry patch! Bartering With Desperate People: There is a lot of interest in bartering among prepper-types. 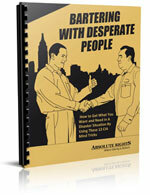 I am not sure I agree with the “desperate” part of the title since realistically, this $7.00 e-Book is more about negotiating the very best deal in such a way that all parties to the transaction are happy. And we all know that bartering is going to become a real issue at some point down the road. What to barter? Read 40 Items to Barter in a Post-Collapse World for some ideas. Bargain Bin: Today I share some items that are related to today’s article. Metrokane Houdini Wine Bottle Stoppers: If you are going to store your liqueur in re-purposed wine bottles, you are going to need some bottle stoppers. These are good choice because the are reusable. Ball Jar Heritage Collection Pint Jars: On the other hand, if you are going to use these for gifts, heritage mason jars would be great. Lucky you if you can find some real vintage mason jars – at a reasonable price, of course. Cordials from Your Kitchen: Easy, Elegant Liqueurs You Can Make & Give : This complete guide serves up more than 100 easy recipes for delicious homemade liqueurs, including fruit liqueurs, nut liqueurs, herb liqueurs, cream-based liqueurs, and flavored brandies, vodkas, and rums. The Home Distiller’s Workbook: Your Guide to Making Moonshine, Whisky, Vodka, Rum and So Much More! Vol. 1 : The author wrote this workbook to pass along the knowledge that was taught to him in the hills of Kentucky. It takes you step-by-step, through everything you need to know to make moonshine and pretty much any other liquor in the comfort of your own kitchen. Eveready 3-LED 6Volt Floating Lantern : Flashlights will make a great barter item. These are great because they can be retrofit into a 2000-hour flashlight using the following little 99 cent eBook: The Amazing 2000-Hour Flashlight . 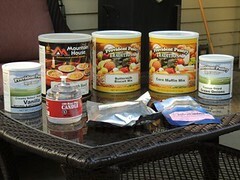 One of the sale items this month is the Super Supply of Freeze-Dried Vegetables . This is a selection of assorted vegetables – a total of 18 #10 cans for $229.99. At 41%, this is one of the better values out there for freeze-dried veggies. Another great item this month is the Military Spec Lensatic Compass for $11.99. This unit has a front window with magnification that allows for precise sighting as you are looking at your target at the same time you are looking at your compass bearing. These are just two of the items on sale this month at Emergency Essentials.